The text material evolved from over 50 years of combined teaching experience it deals with a formulation and application of the finite element method. A meaningful course can be constructed from a subset of the chapters in this book for a quarter course; instructions for such use are given in the preface. The course material is organized in three chronological units of one month each: 1) the finite element formulation for one-dimensional problems, 2) the finite element formulation for scalar field problems in two dimensions and 3) finite element programming and application to scalar field problems; and finite element formulation for vector field problems in two dimensions and beams. In conjunction with the book there will be the access and use of ABAQUS software and MATLAB exercises. Dr. Fish has 20 years of experience (both industry and academia) in the field of multi-scale computational engineering, which bridges the gap between modeling, simulation and design of products based on multi-scale principles. Dr. Fish has published over one hundred journal articles and book chapters. Two of his papers, one on development of multilevel solution techniques for large scale systems presented at the 1995 ASME International Computers in Engineering Conference and the second one, on fatigue crack growth in aging aircraft presented at the 1993 Structures, Structural Dynamics, and Materials Conference have won the Best Paper Awards. Dr. Fish is a recipient of 2005 USACM Computational Structural Mechanics Award given "in recognition of outstanding and sustained contributions to the broad field of Computational Structural Mechanics". He is editor of the International Journal for Multiscale Computational Engineering. Ted Belytschko's main interests lie in the development of computational methods for engineering problems. He has developed explicit finite element methods that are widely used in crashworthiness analysis and virtual prototyping. He is also interested in engineering education, and he chaired the committee that developed the "Engineering First Program" at Northwestern. He obtained his B.S. and Ph.D. at Illinois Institute of Technology in 1965 and 1968, respectively. He has been at Northwestern since 1977 where he is currently Walter P. Murphy Professor and McCormick Distinguished Professor of Computational Mechanics. He is co-author of the book NONLINEAR FINITE ELEMENTS FOR CONTINUA AND STRUCTURES with W.K.Liu and B. Moran (published by Wiley and in the third printing) and he has edited more than 10 other books. n January 2004, he was listed as the 4th most cited researcher in engineering. He is past Chairman of the Engineering Mechanics Division of the ASCE, the Applied Mechanics Division of ASME, past President of USACM, and a member of the National Academy of Engineering (elected in 1992) and the American Academy of Arts and Sciences (elected in 2002). He is the editor of Numerical Methods in Engineering. 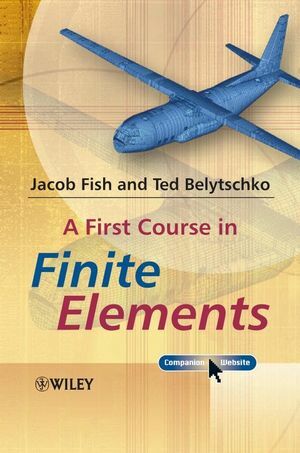 A First Course in Finite Element Methods Access the author's Blog for more information about the book and accompanying files. A First Course in Finite Elements - A Student Companion Site Visit the Web site for A First Course in Finite Elements by Jacob Fish and Ted Belytschko. This Web site gives you access to the rich tools and resources available for this text. It takes a generic approach and so can be used by students from various disciplines in both engineering and science. Finite Elements are a mandatory course on most undergraduate engineering courses. A practical course for both lecturers constructing and planning a finite element module, and for students using the text in private study. It includes quizzes and a solution manual. The accompanying website includes ABAQUS Student Edition, Matlab data and programs, the solutions manual and instructor resources.